…and other thoughts about being away from home. I’m just back from three nights away in Sheffield where I met up with all but one of my Aldeburgh Eight friends. We’ve been trying to meet up again for some time and we managed to arrange to converge in Sheffield for one of the famous Writing Days at The Poetry Business, so that we could also see Peter Sansom who was one of our tutors for the Advanced Poetry Seminar in Aldeburgh. l-r Anita Pati, Kathy Pimlott, Josephine Corcoran, Andrew Rudd, Miranda Yates, Suzannah Evans, John Challis. Missing: Seán Hewitt. 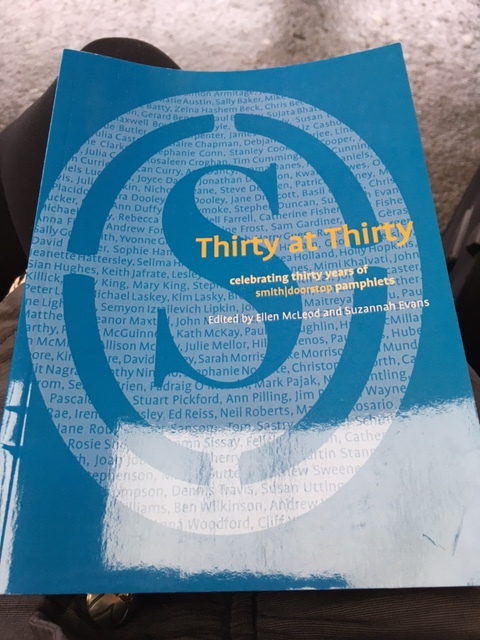 As luck would have it, on Friday night, there was a celebration at the base in Bank Street, Sheffield, to mark thirty years of The Poetry Business and a launch of Thirty at Thirty, a super selection of thirty poems published by Smith|Doorstop from 1986 to 2016. Audience members were invited to read a poem by a Smith|Doorstop poet of their choice and two Smith|Doorstop poets, Sally Goldsmith and Ed Reiss, also read a selection of their own work. 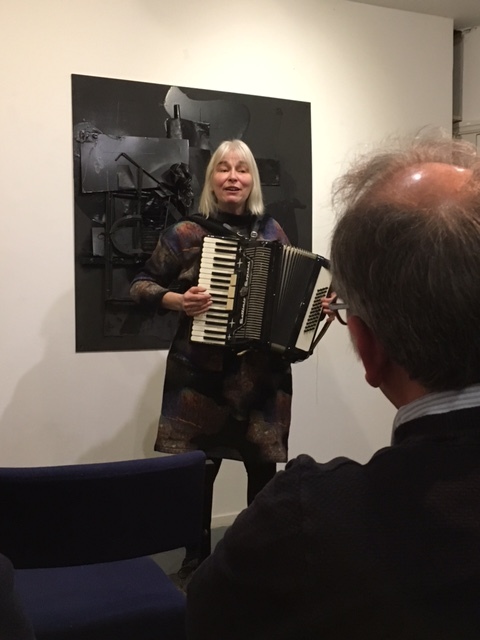 Sally Goldsmith also read poems by Ann Sansom and Peter Sansom and gave a warm and funny appreciation of their years of work, and sang a rude song on her squeeze box! 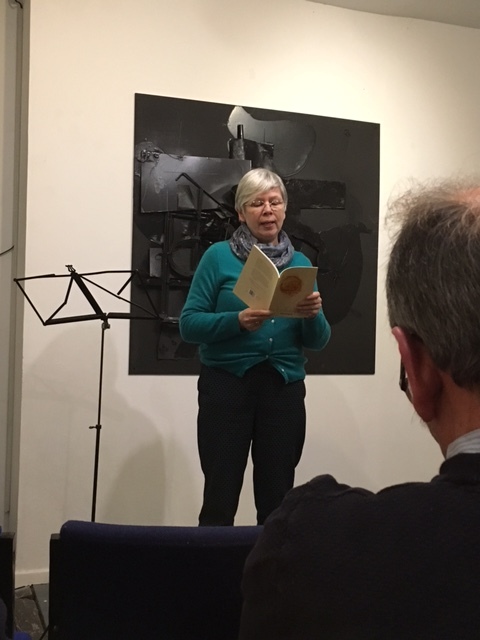 I read a poem by Allison McVety, and two other Aldeburgh Eights, Kathy Pimlott and Suzannah Evans, read poems by Mimi Khalvati and Stephen Knight respectively. 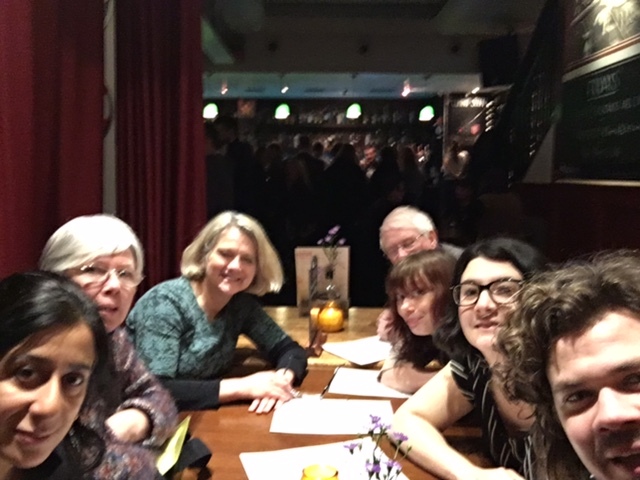 It was an incredibly friendly, cheerful, welcoming, inclusive evening and the first of many times over the weekend when I was acutely aware of how warm and kind everyone was to me, in cold contrast to how people who have left their home are being treated in other places. I’m not just talking about Donald Trump’s Executive Order banning entry to the USA from citizens of Iran, Iraq, Libya, Somalia, Sudan, Syria and Yemen, predominantly Muslim countries. This is clearly shockingly wrong, and I am in solidarity with people who have protested against this unjust legislation, but I have had call to remind myself, especially while I’ve been a traveller away from home, that there are many other situations, including here in the UK, which also reflect badly on the way we treat our fellow human beings and which we should consider doing something about. Muslim lives, the lives of Black and Brown people, the lives of migrants are under attack in the UK too. Many in these communities are fighting for survival amid racist policing and surveillance, gentrification, violence in prison and mental health institutions. Platform, a London-based organisation combining Arts, Activism, Education and Research for social and ecological justice published the following article containing five practical suggestions of action for UK-based people concerned about Trump’s Muslim Ban: UK-based and angry about #MuslimBan? Here’s 5 things to do. I realise that I’m mixing up politics and my weekend away and Sheffield and The Poetry Business and the Aldeburgh Eight all in one blog post which is probably rather messy but it’s becoming increasingly difficult to write in a sealed chamber with no regard to what’s happening on the other side of our closed doors, isn’t it? And we wrote and wrote and wrote. I lost count of the prompts and ideas. It was liberating and encouraging and fun. 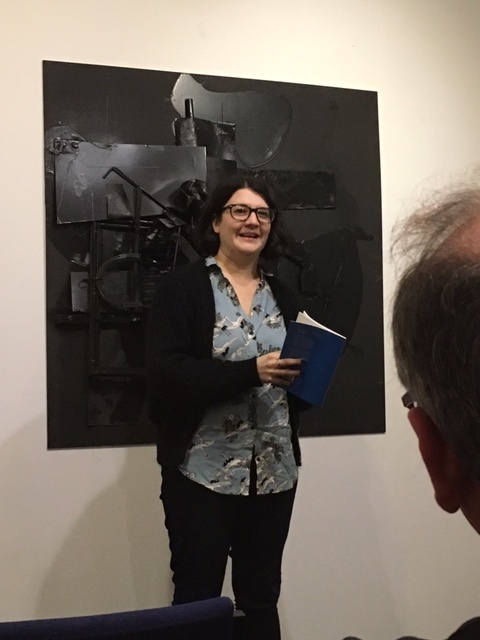 I have no idea if I’ve written anything that I’ll be able to call a poem – actually, that’s not true, I think I might have at least one poem already – and I certainly have some beginnings of poems. In the afternoon, after a rushed sandwich, the large group was split into two smaller groups, one with Ann and one with Peter, and we read and gave feedback on a poem that we’d brought with us. Not everyone from the morning stayed for this, so the groups were more manageable. As is often the case, I felt that people’s comments to me were far more useful than anything I said to anyone else. I wouldn’t say that giving on the spot feedback is my forte. This was the first time that I’d been in a group with Ann and I found her feedback extremely helpful, about my own poem and other people’s. She is skillful at reading poems quickly and suggesting more successful linebreaks and word changes and other suggestions. In all, it was quite a brilliant day, made even better by being among friends and people who were kind and caring. I really wish that this could be the bar the world set for treating others. 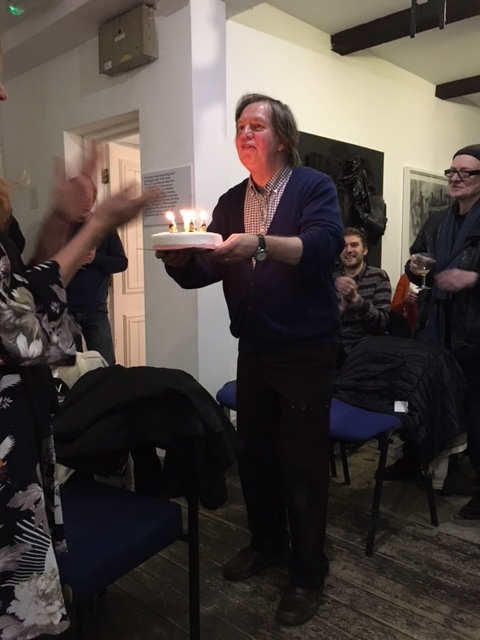 Here’s a picture of Peter on Friday evening with a Poetry Business at 30 birthday cake. A very many Happy Returns to The Poetry Business. Thanks for this post Josephine – for the link to Platform and for your write up of the Writing Day. I’ve been meaning to go to one for ages & will put the next one in my diary immediately! It was hectic, wasn’t it, Josephine. I love that pressure, and I’m lucky because it only takes me an hour to get there…I love the Supertram on those Saturday mornings when I come off the MI and park my car for the day FREE at Meadowhall train station. And yes. I think Ann Sansom is possibly the best editor/tweaker in the world. She’ll nail what’s not quite right, and give you simple tools to put it right. It was lovely to meet you at last.